I'm a huge admirer of The Third Man, a great film directed by Carol Reed, written by Graham Greene, and starring Joseph Cotten, Orson Welles and other fine actors. You can read what Martin Scorsese thinks of the film thanks to a piece in the British newspaper the Independent. 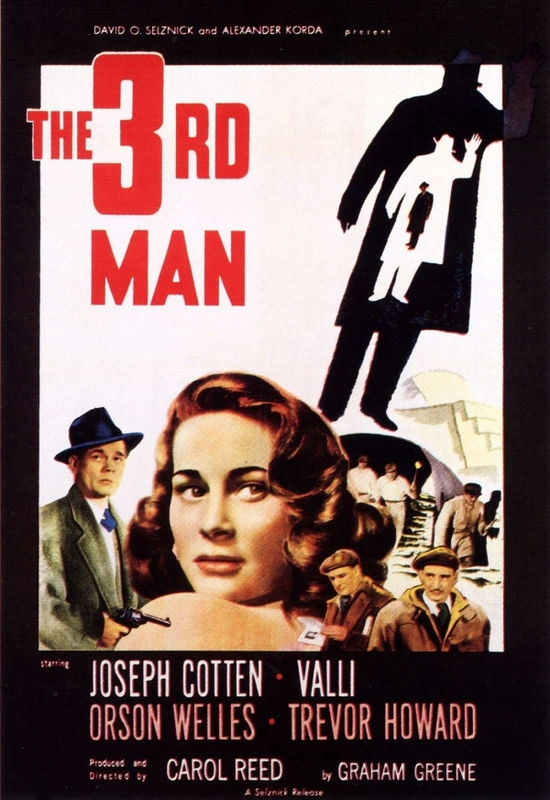 I saw The Third Man for the first time on television in New York, with commercial interruptions. I think I was about 15 years old, maybe 16. I saw Citizen Kane around the same period. I remember that I wanted to see the film on its first release, but was unable to do so, which created a mystique about the film. The theme was a radio hit, but my first viewing was on TV, around '56 or '57. But even with commercial breaks on a 16-inch screen, the power of the picture, the surprise, the entertainment, the film-making itself… a revelation. Expressive style, virtuosity – I became fixated, obsessed. I couldn't wait to see the film again, but I had to wait until it was shown on television, maybe four or five months later. It wasn't the optimum viewing condition, I still lived in a small apartment with my family, so it was difficult to find the concentration and quiet I needed to figure out why the picture affected me so much. I was becoming aware of film-making itself around this time, about storytelling, about extraordinary cinematic experiences. Simultaneously, a young priest who was a mentor to me and some friends gave us Graham Greene's books to read. The Power and the Glory had quite an effect on me. There was a stage version of it off-Broadway, and a live TV play with Laurence Olivier and George C Scott, also. Graham Greene's Catholicism had a strong impact on me, his themes of sin and redemption. I was very much aware of Graham Greene's contribution to The Third Man before seeing it. And I had seen his name on the credits of The Fallen Idol, in particular, the combination of Graham Greene and Carol Reed. I also admired Odd Man Out, as both of these films were shown on TV constantly. ... Has it had an influence on my career? When I saw it, I was ripe for it – ready to understand what you can do with the camera. The themes of the picture made me feel comfortable about dealing with similar kinds of characters, characters you'd consider undesirable - the charm of evil. I did a paper on the film when I was 18 at NYU. The professor had different ideas. He wrote a note on the paper: "Remember, it's only a thriller." I disagreed. We know what happens in Psycho or Vertigo or The Red Shoes. So why do we keep watching? If some dismiss a work because it "fits" into a genre, then why does it sustain repeated viewings? It's more than the plot twists and surprises of the story. Certainly, it's the characters, the world they inhabit, the love stories, the trust and betrayals – the human heart. Each presented with intelligence, wit, and a very real joy of film-making, while still feeling fresh. Note: I named The Third Man's Harry Lime character as one of the top three villains in my Crime Beat column. I named Martin Scorsese' Jimmy the Gent and Tommy from Goodfellas and Ian Fleming's Auric Goldfinger from Goldfinger as the other top film villains.